playing snowball fights and building snowmen. to make in time for Christmas. for a delightful Christmas wall hanging. and spread the news around, so everyone can join in. without the hexagons if you wish. appox 10" WOF of background for sashings. assorted 1 1/2" squares for border. for Moda charm pack) with leftovers. OOOOOoooo DAWN you're up late, but I'm glad because this new BOM is going to be so CUTE!!! Will blog about it soon as it's done!! Will be stitching this up this evening along with Jenny's!!! Vikki has something for me too... I am in stitching heaven....so many great projects to work on. This is so cute! I just posted about it on my blog! Thanks Dawn! This is absolutely sweet! Thank you so much for sharing! I am looking forward to make my own block and all the ones coming! How darling! Thank you so much for sharing the bom! I linked over from Terry's blog...and am delighted that I did! Love your header...so sweet and charming! LOVE IT Dawn!!!!! And boy could I use some snow right now - 90F outside. A very timely project for me, lol! And too, too darling! Thank you dear one! Cant wait to see the next one!! Thanks for sharing this BOM. I love hexagons, I love snowflakes! Ooooh Dawnie, this is GAWJUS!!!! Love it to bits ;o)!!! Thank you Dawn... this is so cute and I LOVE snow flakes.. Thank you so much Dawn!!! I love snowflakes - wish we could have some here! Oh Dawn, this is gorgeous! Gorgeous!!! I will be making this for sure! :-) Lovely snowflakes to share on your birthday, sweet friend! That is very cute :) Thanks for sharing this with us!!! Thank you so much for this adorable design!! Thank you for your generosity. The timing couldn't be better for me. I was just wondering which holiday item to start on and this will be it! I love hexies ! Thanks for the freebie! Think this will be a cute BOM. Will print it out now. Fancy giving a gift to others on YOUR birthday...thankyou, this looks lovely...Ok we all say 'no more new things'...but it is cute. Now go EAT SOME CAKE!!!!!!!!!! I love this first snowflake! Thanks for sharing and thanks too for posting Patches 4 Lissa button!! Happy Birthday and thank you so much for the wonderfull free pattern! Thanks Dawn I love snowflakes and snowmen and anything Christmassy. And A Very Happy Birthday! What a lovely BOM! Thank you so much. I will print it out, so may be there will be a new wallhanging for Christmas. Thanks for sharing! Happy birthday sweetie!!!!! Have you had a lovely day??? I hope so! LOVE your BoM!!!! I have just recently made my first hexies and need some practice, help, or maybe a few cups of coffee before I begin!!! LOL.. LOVE the snowflake Dawnie - love the colours, fabs, it's just the cutest! This is adorable. Think I will have to get to and join in. Thank you Dianne. Just found out it's your birthday! Have a wonderful 'rest of the day'. Happy birthday Dawn, and thanks for your new BOM. Happy Birthday! Pretty BOM. I'll be watching everyone play since I don't applique or do stitchery. Darn. I'm so glad to have found your blog! Absolutely love your header! I see everyone is wishing you a Happy Birthday. Have a beautiful day. This little BOM looks fun. I just did a post on my blog including it. thanks for sharing it with us. This is so cute and so perfect with all my snowmen. I found you at Paulette's at Sweet P quilting. I don't have a blog, but I will be following you to get this great BOM. Thanks from a follower in West Tennessee. Happy Birthday wishes sent to you from New Mexico! Thanks for the new Snowflake BOM. I would love to follow along. I have never done hexes before and they look like a lot of fun. Plus I LOVE SNOWFLAKES!! Thank you for offering this free Snowflake BOM! The first block is beautiful..I'm excited to make this! Happy Birthday to you! Thank you for giving us the gift! WOW! I just started playing with hexagons so this is wonderful! I do not have a blog ( I am a lurker!) but will share. Thank you Dawn!! I heart snowflakes too! Happy Birthday to you! I lover snowflakes as well! Thanks for sharing your lovely project Dawn and HAPPY BIRTHDAY! 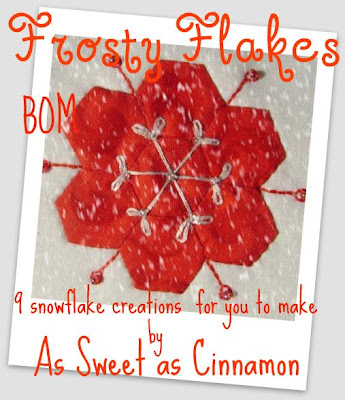 How wonderful to have a snowflake project! I'm a big fan of winter here in Ohio and love snowflakes - thanks so much for designing these blocks and for being so generous in offering them for free! This design is gorgeous - I love the fabric too! Thank you so much for this BOM. I love hexies!!! It is very pretty! I have so much on the 'go' right now I will have to give this free-bee a miss. How generous of you Dawn. Hope you are spolit rotten by lots of people - just as you are spoiling us! Very lovely Dawn, I'll try and make time for this one. Hexis are the flavour of the month!! This is just so darn cute...thanks so much!! Can't wait to make it! Ohh, this is so beautiful. I want to make this. Hugs from Norway. What a wonderful BOM. This first block so sweet. Thank you for sharing your talents. I hope I can get started soon. I am having cataract surgery. The right eye is done. I have the left eye done soon. Have a super great sewing day. Beautiful! I can;t wait to make this little hexagon -filled beauty! But just one question, what's a BOM? Greetings from the Washington DC area, and thank you for this BOM. Too cute:)!!!!!! Thank you Dawn. I am joining in too! Thank you for the snowflake. Hugs, Donna in Brisbane. I have gathered my fabrics and can hardly wait until tuesday so I can start the hexies, thanks for the pattern Dawn i`m sure everyone is going to enjoy this journey with you. Happy Birthday Dawn, many, many more! Great BOM to offer - have share your BOM at my blog. Very nice block I am going to start on it today, I have been wanting to do some applique along with embroidery. we love your snowflakes and looking forward to every next week.. Thank you. I've been looking for some places to visit that deal with different crafts and found you. This is beautiful. Frosty Flakes - The Quilt! Frosty Flakes BOM block Two. Birthday Treats from Special Friends! 'Springtime' Fresh Hope redwork quilt revealed.